There is no set fee. Our zazenkai is supported by dana (donations) from our students. Dana covers our expenses such as (fee for the space, zazen equipment, etc). A basket for dana (donation) is placed outside of the zazenkai. 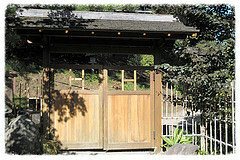 Our zazen sitting meditation starts at 8:00am Sundays. To avoid interruption to other students, students must arrive before 8:00am. New Students are asked to arrive at 7:45am for the orientation. Students must wear long pants and white socks. 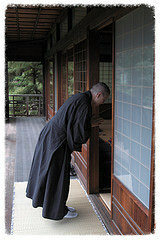 Our zazen sitting meditation is for 55 min followed by teisho. Students will leave around 9:15am. 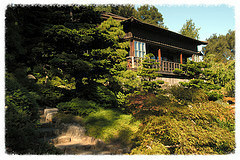 Our zazen class is offered at the Upper House which sits on the slope of the Moon Viewing Hill at Hakone Gardens in Saratoga, CA. Entrance is located at upper side of the parking lot. Please enter through the gate which has “Office” sign. Enter 2nd gate in front of you. 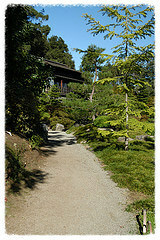 Go up the path to the upper house. 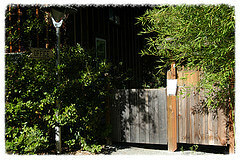 Enter our zendo @ Upper House. Shoes are removed outside our zendo. They are placed in an orderly line with toes pointing outward. Upon entering the zendo, a bow is made with hands in gassho (palms together with fingers pointing upward, indicating respect).